On Sunday night, I fell asleep early on the couch. As is often the case, I woke up in the middle of the night unable to fall back to sleep. Bleary-eyed, I flipped to ESPN to check out scores and highlights. A flash of red caught my eye on the scroll as it passed by and I saw a mention of President Obama. I immediately went back to see what it was. I was shocked to see that we actually got Bin Laden. Like many others, I was happy to see that Bin Laden was dead. I quickly flipped to the various news channels to get more details about what happened. Just like 9/11 and the days following it, I found myself glued to the coverage. The only difference this time was that I was experiencing more than just news coverage. I was also reading peoples’ reactions on Facebook. As the day progressed, I saw more and more people posting a quote by Martin Luther King Jr. (which it turns out was only partially his words, the rest were added by someone else to make their point). The quote intimates that it is wrong to celebrate anyone’s death. 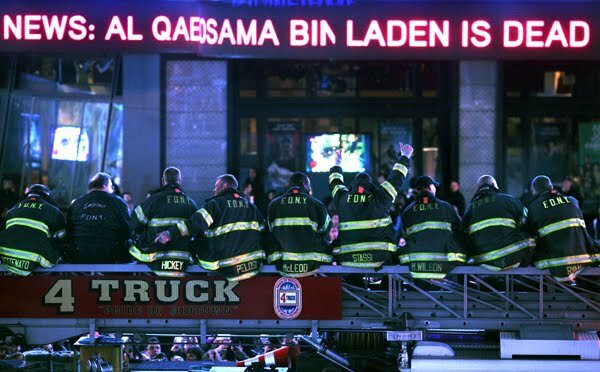 Ironically, the 9/11 attacks brought us all together as a country, but the killing of Bin Laden seems to have created a divide how we view his demise. So many people are disgusted with the Americans who celebrated at the White House and at Ground Zero. Somehow, they have twisted these celebrations to be on par with the celebrations of the fanatics and zealots who danced in the streets on 9/11 after the attacks. How they arrived at this comparison is beyond me. The two celebrations are nothing alike. And while I wasn’t out in the streets celebrating, I have no problem with those who were. Maybe I would have been a part of it if I were in the area. Maybe I wouldn’t have. There’s no way to know for sure. For those who believe that we as Americans should take the “high road” and not celebrate the death of Bin Laden, I simply ask….why not? This evil monster has forever changed our way of life and our way of thinking. I can still remember the morning of 9/11 as if it were yesterday. The sky was so blue and so perfect that it looked more like a painting than reality. It was the kind of day that put a smile on your face and made you happy to be alive. It was peaceful…until the first plane hit the Twin Towers. And then…it was mayhem! I did not lose anyone close to me on 9/11, although I thought that I did for a while when I was unable to reach my wife who was working in the area. I cannot imagine the pain of those who lost loved ones on that day. The “lucky” families actually got to bury their loved ones. When that coward Bin Laden planned these attacks against innocent people, he never gave any consideration to the families who would never get to have a proper burial. And yet, his brother requested his body back so that they could give him one. For those who like the high road, you should be pleased to know that our government disposed of Bin Laden’s body in a respectful way, in a way that followed the laws of Islam. They cleansed his body and made sure that he was buried at sea within the 24-hour timeframe that his religion mandates. By way of comparison, most families of 9/11 victims held off on having any kind of funeral or memorial service in hopes that they would have something…anything…to bury. Imagine waiting to honor your lost loved one because you are holding out hope that you will get back a finger, a toe or a small bone fragment. That’s all that I could think about yesterday when the news showed how we disposed of Bin Laden’s body. He didn’t deserve the proper burial that he got. As Americans, our government left us no choice but to take the high road in disposing of Bin Laden’s remains. Personally, I would have liked to have seen them vaporize him on television for the world to see. At the very least, I would have waited more than 24 hours to bury him at sea, and I wouldn’t have prepared his body for the burial. I would have dumped him in the sea like the piece of garbage that he was. My happiness to see Bin Laden dead quickly turned to rage about what he did and how he was treated with respect after we killed him. It made me angry to see so many people taking the high road and saying that this was not a time for celebration. One of the things that makes this country great is freedom of speech, so I have no problem with people voicing their opinions. I guess I’m just a little bit surprised to see more disdain for the celebrations of Bin Laden’s demise than joy over the fact that the world is a better place without him. This isn’t about closure for me, and based on the interviews that I’ve seen with family members of 9/11 victims, it isn’t for them either. I realize that there will be others to step up in his place and carry on the hatred of America. This is about justice. Celebrating Bin Laden’s death is about justice finally being served. It is about showing the rest of the world that if you attack us, we will stop at nothing to eliminate you. It is about showing supposed allies that we will do whatever it takes to achieve our goal, even if it means stepping on your toes. It is about showing the rest of the world that we are a force to be reckoned with even if we lose our grip on being the world’s biggest financial superpower. Celebrating Bin Laden’s death is about American Pride. It is not barbaric bloodlust. And it certainly does not mean that we are reducing ourselves to the level of those who danced in the streets on 9/11 when thousands of innocent people were killed. The celebrations are nothing more than a visceral response to the deserved killing of an evil coward who is responsible for the most tragic day in American history.